What is so strange about the Vancouver South poll is Wai Young at 33%. 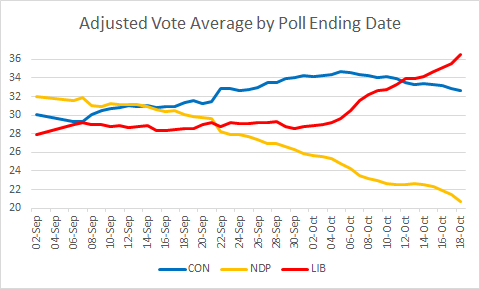 Even though the NDP vote has gone from a high of 30% down to 19%, as per the polls, its shifted support to the Greens and the conservatives. Must be all the ethnic ads about marijuana, and prostitution that might be hurting the liberal candidate. If 2011 results are a guide, the liberal candidate very much needs to pull in a lot more of the liberal support because vote splits are really hurting in BC on the progressive side. Of all candidates, it just surprises me that people support her. The Tories have done a tremendous job reaching out to the Chinese-Canadian community. Word is that last time, they had such strong support among that group (especially those that came to Canada relatively recently) that in some ridings, they decided to not spend resources identifying Chinese-Canadian supporters, and just tried getting as many of them to vote as possible. Immigrants from Mainland China may also not be very bothered about the government being authoritarian, secretive and trampling civil liberties. After all, it's still much better than in China. 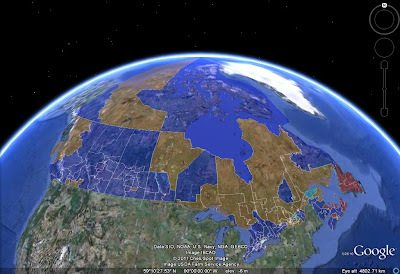 Yup its pretty rough living in the most admred country in the world 4 of last five years. @Habs24cups, Nobody is saying that Canada is still not an admired country, the point is a gradual erosion of our civil liberties. Its a slippery slope that people are arguing against. Developed Countries around the world are going down this path and its not necessarily unique to ours. Being the cleanest dirty shirt is a thoughtless response especially when it involves a candidate like Wai Young who said Jesus would support bill C-51 and that too, inside a church. In my church, who are supposedly non profit and non partisan, I've been disappointed at them hinting at whom they thought people should vote for. If the church wants to invite riding candidates, they should do it for all of them or none. Yeah I agree church and politics shouldn't mix .However the same sort of tactics are used in the union movement ..... Workers pay dues union reps give money and support to Libs or Dippers. Not everyone in unions are lefties. Yeah, it was pretty disgusting when BCTF was mostly unable to provide strike pay to its members who are charged around $2,000/yr in dues because they blew most of it on politics (basically campaigning against the BC Liberals). I'd be apoplectic if I were a teacher. - In Forum's case, they haven't been too out of whack except for the 9/28-29 poll, which happens to be the base for Léger's comparison. - In EKOS' case, the base is 9/23-29, and the early part of that was a period where the Liberals were low. So it's normal that EKOS showed movement. 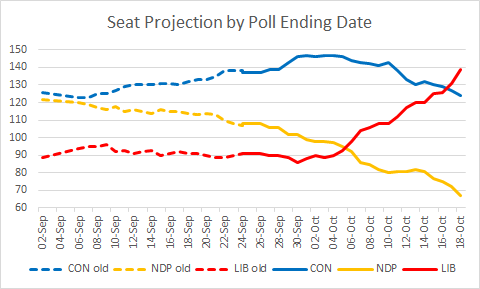 - I don't know about Mainstreet, but its riding polls have been generally consistent with provincial swings. Léger is a very good pollster, but there's this belief among some in Québec that it's much better than all the other ones. Mr. Léger might have just been trying to support his brand.